What a party !! Today over 29.000 fans celebrated in Luigi Ferraris the return of Genoa in Europe, while also outside the stadium the people changed the city completely into red and blue. Before the match the historical team of Genoa that reached the last qualification to Europe in May 1991 against Juventus was on the field and then the stars of today started their celebration show against Lecce that relegated to Serie B last week. Genoa scored 4 times today: Jankovic opened the score before halftime, but 10 minutes after him Tiribocchi scored the equalizer: 1-1. After the tea Criscito and 2 times Milito scored the last 3 goals of the season. Yesterday our topscorer with 24 goals (1 less than Ibrahimovic) wrote an open letter to all Genoa-fans to say that after his adventure with Inter our Diego wants to finish his career in his city Genova with his red and blue family ! Hopefully Diego Milito takes Thiago Motta with him when he returns to Genova. Genoa finished the season with 68 points, a record ! Because of the goal-difference Genoa should be 4th in the standings and qualificated in Champions League, but because of the results against Fiorentina (3-3 and 0-1) that also has 68 points we have to leave the 4th place to them. No problem, it is better to win Europa League in May 2010 then to be out of Champions League in the 1st round, like Fiorentina this season ! 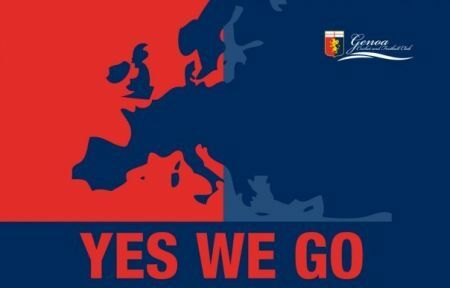 After Barak Obama conquered the world with “Yes we can”, now it is time to Genoa that celebrates the return in Europe with the slogan: “Yes we go”. 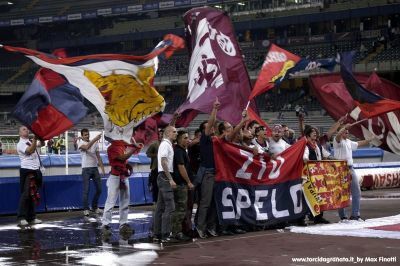 Only 3 years ago at 28th May 2006 Genoa lost the first match of the play-offs in Serie C-1 against Salernitana and now we reached the fifth place in Serie A and return in Europe after 17 years. Unfortunately we lost Diego Milito and Thiago Motta to Inter, but Diego already has 2 substitutes: the 27 years old striker of Atalanta: Sergio Floccari and the famous 34 years old central-forward of Inter: Hernan Crespo. 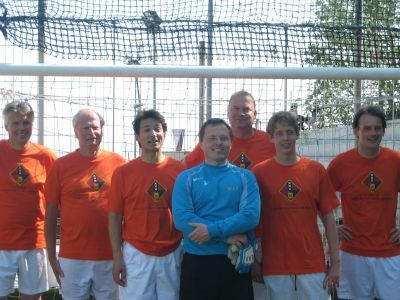 Mr. Preziosi also promised 4 other new arrivals to build a team that is as least as good as this dreamyear: 2008-2009. This afternoon Genoa did win the match against our friends of Torino. Diego Milito scored twice (0-1 in 32nd minute by penalty and 2-3 in 89th minute with a header), while Ruben Olivera scored the other goal (1-2 in 48th minute by free-kick). The match ended with a big fight immediately after the last whistle of referee Saccani between a lot of players. 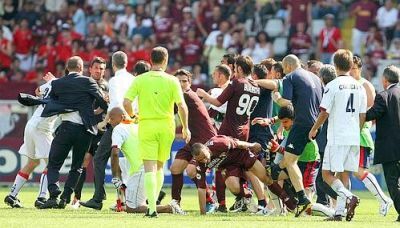 Hopefully the victory of Genoa in the last minute don’t lead to the relagation of Torino or remarks the end of a very long friendship since 1973 between the fans. On the other hand: since Genoa-Venezia 11th June 2005 we know that you always have to play a regular match and always must try to win it. If another team can’t stand us because we beat them, it is their problem not ours ! After the transfernews today it is time to play the 37th round of Serie A, so for Genoa to save the 5th place which means we don’t have to play in the preround of Europa League. 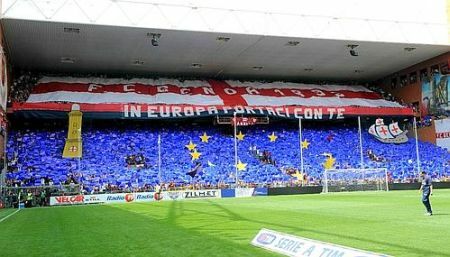 Genoa plays today with the support of 1400 fans in Stadio Olimpico of Turin against our friends of A.C. Torino who are in danger to fall down to Serie B. A few minutes ago our president Mr. Enrico Preziosi admitted on televison that Inter bought Diego Milito and Thiago Milito, probably our best 2 players of this season. Genoa gets a lot of money (€ 16 million ?) and some players of Inter (Aquafresca, Crespo and Arnautovic ??) in return, but the players first have to sign the contract with Genoa before Mr. Preziosi can publish their names. Of course it is sad that our best 2 players leave Genoa, but last year we also lost our 2 best players with Borriello and Konko and this year we only became stronger … and our most important “player” Gasperini stays. Mr. Preziosi also brought the news that Genoa already bought (€ 11 million) striker Sergio Floccari of Atalanta, who scored 12 times so far this season. 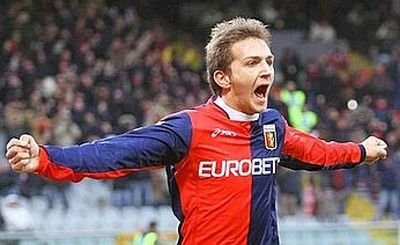 The 27 years old striker already played 9 matches with Genoa in the season 2002-2003 (Serie B) in which he scored 1 goal against Catania. One thing is sure, Mr. Preziosi promised us an even stronger team than this season and the last years prove that we can trust him ! 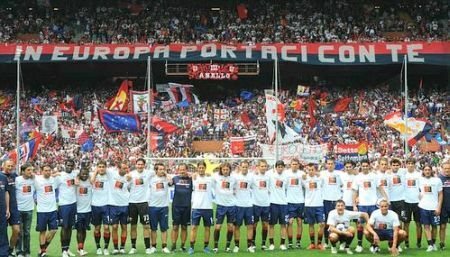 2nd United in the name of Genoa big succes ! 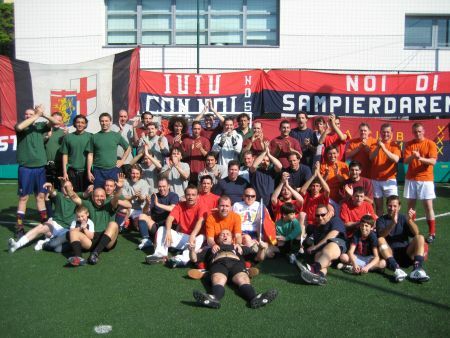 Because of the fantastic organisation of Luca Carini and his friends the tournament was a big succes. 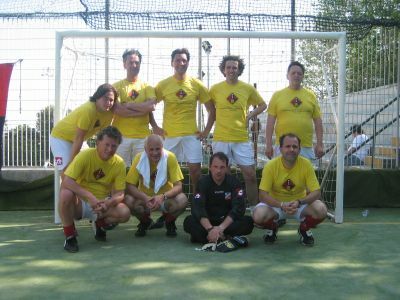 The second team of Genoa Club Amsterdam reached the 3rd position, while the All Blacks of Toscany did win the final against the Grifoni In Rete. Genoa’s defender Mimmo Criscito gave the trophies to the winners at the end of this fantastic sunny day. 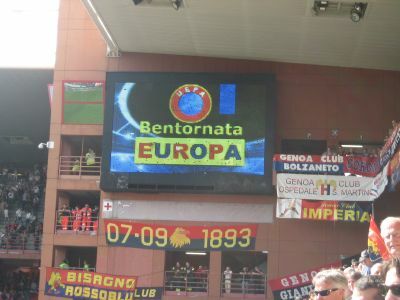 Genoa back in Europe after 17 long years !!! Exactly 17 years, 1 month and 2 days after Ajax-Genoa (1-1) we are back in Europe! 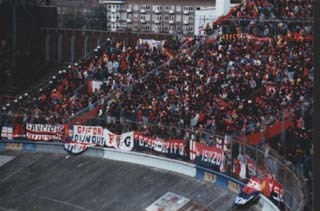 Since the match in Amsterdam at 15th April 1992 Genoa played 5 years in Serie A (92-93, 93-94, 94-95, 07-08 and 08-09), 11 years in B and 1 season in Serie C-1 (05-06) because of the punishment after Genoa-Venezia. Now 3 years later we are back ! In the match against Chievo Verona the team of Mr. Gasperini missed 5 line-up players: Biava, Sokratis, Mesto, Criscito and Palladino and this was the reason our team did not reach the usual level. After Genoa missed several chances it was Pinzi of Chievo Verona in the 34th minute who scored on the other side of the field: 0-1. In the second half Genoa was stronger with Vanden Borre at right and Juric in his usual position on the leftside of the midfield. In the 57th minute Diego Milito earned a penalty, which he realized himself: 1-1. After 64 minutes Mr. Gasperini changed Sculli by Olivera and our Uruguyan striker scored a fantastic free-kick only 6 minutes later: 2-1. Unfortunately this was not the last goal in the match: in the 85th Pellissier scored the equalizer: 2-2. Genoa is still on the 5th position in the standings with 62 points, 5 less than Fiorentina but 5 more than Roma that plays in San Siro against Milan next week. If Genoa ends the season on the 5th position our boys have to play only 1 round of Europa League on 20th and 27th August to reach one of the 12 groups of 4 teams that play a full competition. 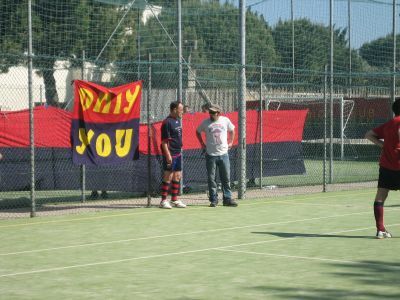 Saturday-afternoon the 2nd edition of United in the name of Genoa takes place at the calcetto-fields in Via Campanella in the Albaro area in Genova. The 2 teams from Amsterdam leave Friday from Holland to Nice (France) and arrive in the late afternoon in Genova after visiting Genoa’s trainingfield Gianluca Signorini. 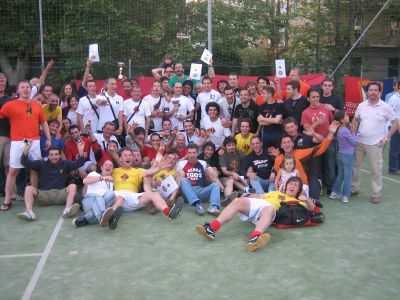 Mimmo Criscito shows up Saturday-evening around 19.00 hours at the calcetto-tournament to hand over the trophies to the winners and Sunday we all watch Genoa-Chievo in Distinti to see the return of Genoa in Europe after the last match at 15th April 1992 in Amsterdam. Today Genoa played one the most bad matches of the season, but we had some excuses: at first of course the derby last week. We missed 3 important line-up players with Biava (injured), Ferrari and Motta (both banned) and also our supporters could not support the team today. Genoa started with the excepted 3 very young defenders: Sokratis (20), Bocchetti (22) and Criscito (22) and they saved the match together with goalkeeper Rubinho. After only 9 minutes Sergio Floccari (the newspapers say he already signed a contract with Genoa and plays with us next season) ran towards Rubinho and passed the ball besides to Valdés who could easily score the opening-goal: 1-0. Before halftime Genoa received 3 yellowcards and all 3 players are banned next week against Chievo: Sokratis, Criscito and Mesto. 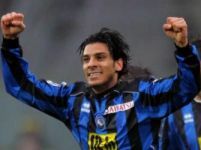 Only Diego Milito was once close to the equalizer in the 45th minute, but Rubinho saved the biggest chance of the first half of Atalanta by Floccari so we could be happy halftime arrived with only 1-0. In the second half with Rossi and Jankovic in stead of Milanetto and Mesto our team played a lot better. Several chances were missed but in the 90th minute with 11 against 9 (Guarente got a red card after 2 heavy fouls in only 5 seconds and Floccari left the field with an injury after Atalanta already substituted 3 players) our defender Mimmo Criscito enlarged a shot of Diego Milito into the goal: 1-1. In the 3 minutes extra time Genoa tried to win the match, but it ended with the 1-1 draw. Because Fiorentina beat Catania on Sicily we are now 3 points behind them on the 5th position in the standings. The advantage to number 7 Palermo is 9 points with only 3 matches to go, so we only need 1 point to be back in Europe after the 1-1 draw at 15th April 1992 in the Amsterdam Olympic Stadium against Ajax.